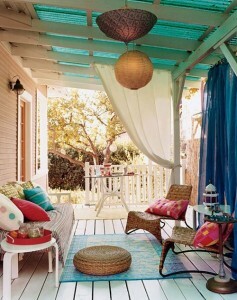 Combining an abundance of accessories can really help define an outdoor space like this in your new home. 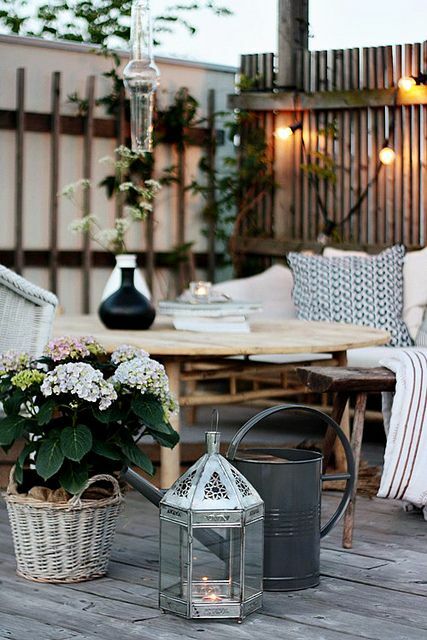 Clustering things like potted flowers, oversized lanterns, garden stools/benches and flowering cans can really help fill up a space without needing to invest in costly outdoor furnishings. 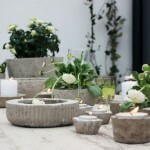 Accessorizing in this way can help transform even a small area into an outdoor living room worthy of hours spent outside. 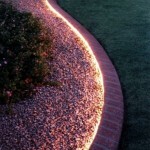 Best of all most of these items can be reused year after year. 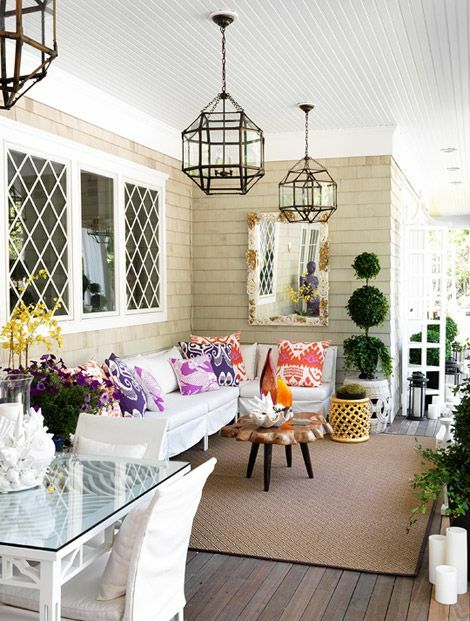 A vibrant arrangement of colourful toss cushions in this chic outdoor living room provides the basis for loads of character and elegance for your new home exterior. 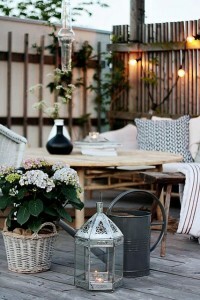 A simple area rug defines this great space which is stylishly anchored with borders of candles and plants. Numerous indoor elements like an oversized mirror and geometric glass lighting fixtures juxtaposed with a rustic wood coffee table and seashell tabletop accessories creates an eclectic mood in this fabulous outdoor living room. For a much more budget conscious take on the outdoor living room for your new home, this bohemian inspired outdoor living room encompasses many of the same elements without breaking the bank. Colourful toss cushions with a vibrant area rug can be found inexpensively at your local Wal-Mart, Homesense or Ikea stores. Instantly spruce up an inexpensive outdoor sofa with a patterned throw like this stripe one and add some mood lighting with a pair of inexpensive paper lanterns. Take full advantage of having a living room outside and rather than an occasional table or coffee table, why not substitute that for a fire pit like this one? 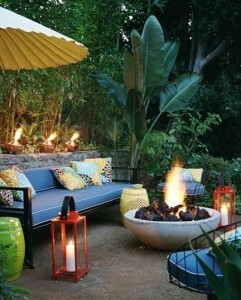 This outdoor living room encompasses a tropical feel you can also achieve in your new home with oversized tropical foliage, open flame accessories like lanterns and little tiki pots, garden stools and a whimsical style umbrella for a relaxed and inviting atmosphere. For more great tips and new home decorating inspiration, be sure to visit the Mosaik Homes Facebook Page!